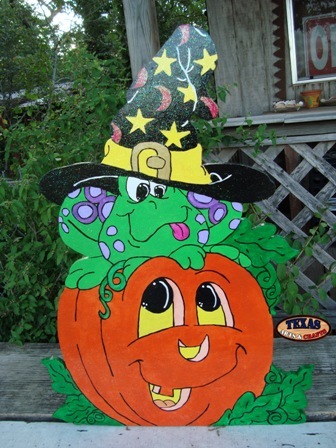 The Frog With Pumpkin yard sign is built in our workshop. The pumpkin is hand painted orange. The frog is painted green with purple spots. The frog is wearing a black hat with stars and moons on it. The dimensions for the yard sign are 29 inches tall by 21 inches wide by 1.50 inches deep. The yard art has a 26.50 inch stake. The weight with packaging is 5 pounds. For the continental U.S. shipping and handling is included in the listed price. For shipping outside the continental U.S. please contact us through our Contact Us page. The Giant Pumpkin yard sign is built in our workshop. The pumpkin is hand painted orange. The eyes, mouth and nose are painted yellow. The dimensions for the yard sign are 33.50 inches tall by 23 inches wide by 1.50 inches deep. The yard art has a 36 inch stake. The weight with packaging is 5 pounds. For the continental U.S. shipping and handling is included in the listed price. For shipping outside the continental U.S. please contact us through our Contact Us page. 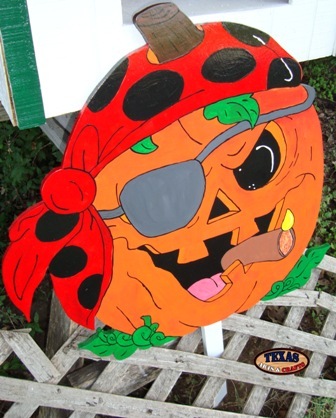 The Pirate Pumpkin yard sign is built in our workshop. The pumpkin is hand painted orange with a red and black bandanna. The pumpkin has an eye patch and he is smoking a cigar. The dimensions for the yard sign are 23 inches tall by 14 inches wide by 1.50 inches deep. The yard art has a 21 inch stake. The weight with packaging is 8 pounds. For the continental U.S. shipping and handling is included in the listed price. For shipping outside the continental U.S. please contact us through our Contact Us page. 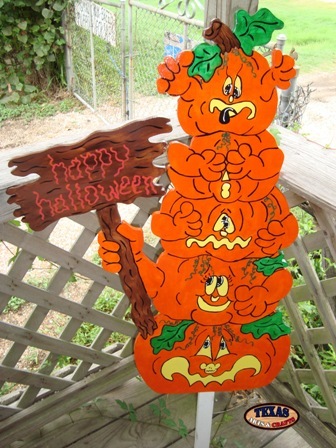 The Happy Halloween Pumpkin Stack yard sign is built in our workshop. The pumpkins are hand painted orange. The pumpkins are holding a sign that reads Happy Halloween. The dimensions for the yard sign are 32.50 inches tall by 21 inches wide by 1.50 inches deep. The yard art has a 27 inch stake. The weight with packaging is 10 pounds. For the continental U.S. shipping and handling is included in the listed price. For shipping outside the continental U.S. please contact us through our Contact Us page. The Evil Pumpkin yard sign is built in our workshop. The pumpkin is hand painted orange with yellow eyes and purple underneath the eyes. An Evil funny face is painted onto the pumpkin. The dimensions for the yard sign are 13 inches tall by 13.50 inches wide by 1.50 inches deep. The arts and crafts sign has a 16 inch stake. The weight with packaging is 2.50 pounds. For the continental U.S. shipping and handling is included in the listed price. For shipping outside the continental U.S. please contact us through our Contact Us page. 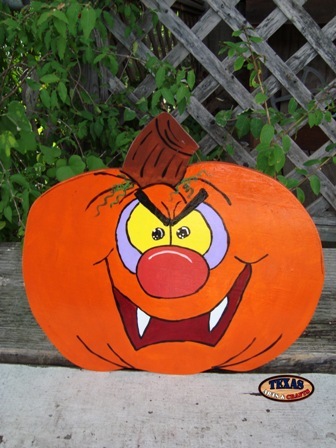 The Frightened Pumpkin yard sign is built in our workshop. The pumpkin is hand painted orange with green eyes. A frightened funny face is painted onto the pumpkin. The dimensions for the yard sign are 16 inches tall by 13.50 inches wide by 1.50 inches deep. The yard art has a 17 inch stake. The weight with packaging is 2.50 pounds. For the continental U.S. shipping and handling is included in the listed price. For shipping outside the continental U.S. please contact us through our Contact Us page. 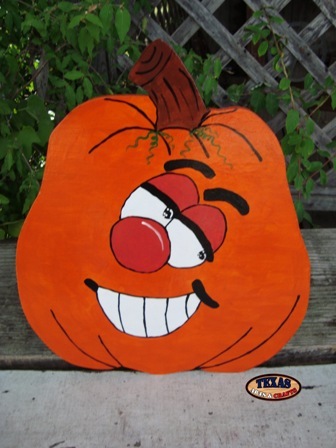 The Goofy Pumpkin yard sign is built in our workshop. The pumpkin is hand painted orange with white eyes. 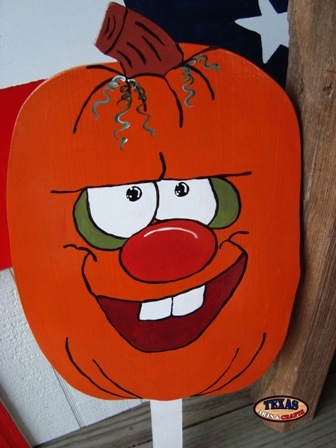 A goofy funny face is painted onto the pumpkin. The dimensions for the yard sign are 16 inches tall by 10.50 inches wide by 1.50 inches deep. The yard art has a 16 inch stake. The weight with packaging is 2.50 pounds. For the continental U.S. shipping and handling is included in the listed price. For shipping outside the continental U.S. please contact us through our Contact Us page. 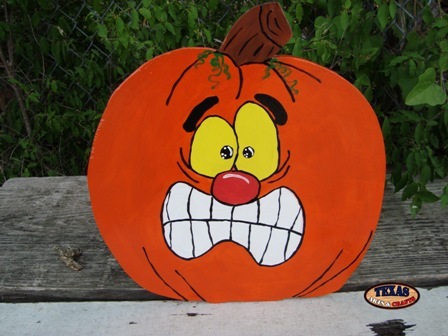 The Infuriated Pumpkin yard sign is built in our workshop. The pumpkin is hand painted orange with green eyes. 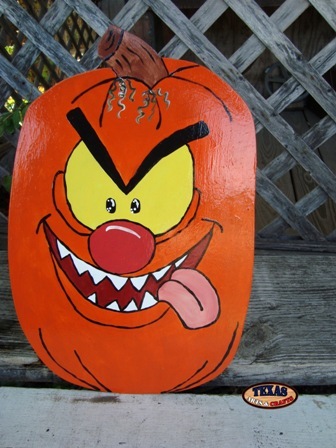 A growling, angry funny face is painted onto the pumpkin. The dimensions for the yard sign are 13 inches tall by 12 inches wide by 1.50 inches deep. The arts and crafts sign has a 16 inch stake. The weight with packaging is 2.50 pounds. For the continental U.S. shipping and handling is included in the listed price. For shipping outside the continental U.S. please contact us through our Contact Us page. 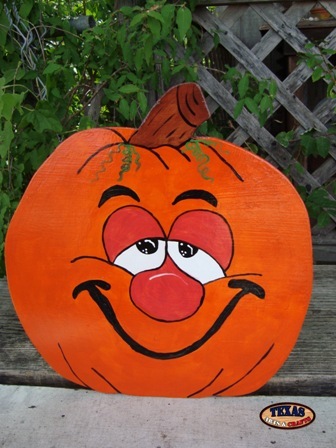 The Jovial Pumpkin yard sign is built in our workshop. The pumpkin is hand painted orange with white eyes. A very happy and joyous expression is painted onto the pumpkin. The dimensions for the yard sign are 16 inches tall by 13.50 inches wide by 1.50 inches deep. The yard art has a 16 inch stake. The weight with packaging is 2.50 pounds. For the continental U.S. shipping and handling is included in the listed price. For shipping outside the continental U.S. please contact us through our Contact Us page. 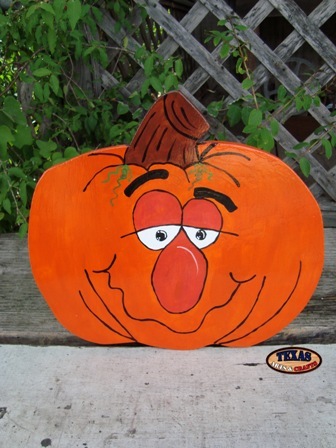 The Love Struck Pumpkin yard sign is built in our workshop. The pumpkin is hand painted orange with white eyes. A twitterpated funny face is painted onto the pumpkin. The Sad Pumpkin yard sign is built in our workshop. The pumpkin is hand painted orange with white eyes. A Sad funny face is painted onto the pumpkin. 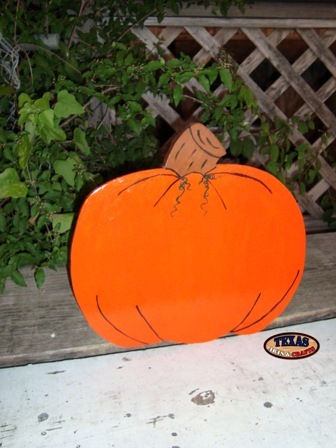 The Sneaky Pumpkin yard sign is built in our workshop. The pumpkin is hand painted orange with yellow eyes. A Sneaky funny face is painted onto the Pumpkin. 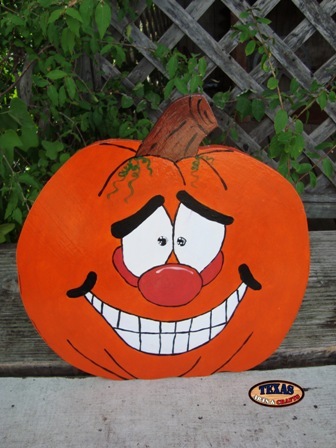 The Worried Pumpkin yard sign is built in our workshop. The pumpkin is hand painted orange with white eyes. A worried expression is painted onto the pumpkin. 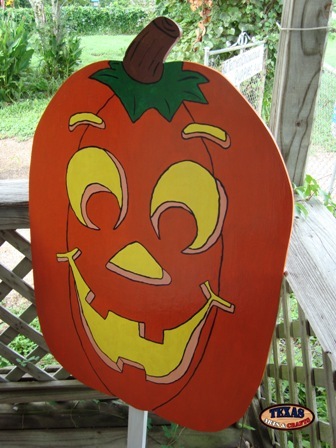 The Scared Pumpkin yard sign is built in our workshop. The pumpkin is hand painted orange with yellow eyes. 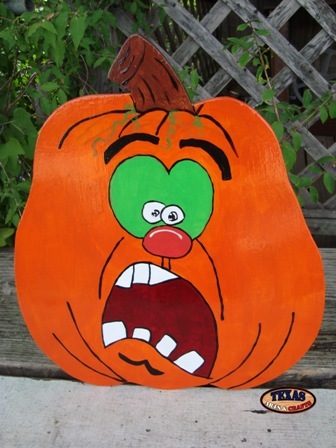 A scared expression is painted onto the pumpkin. The dimensions for the yard sign are 12.50 inches tall by 12.25 inches wide by 1.50 inches deep. The arts and crafts sign has a 18 inch stake. The weight with packaging is 2.50 pounds. For the continental U.S. shipping and handling is included in the listed price. For shipping outside the continental U.S. please contact us through our Contact Us page. 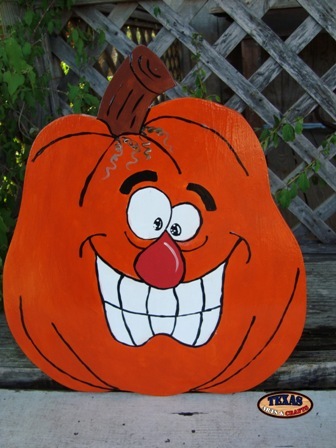 The Pumpkin With Toothy Smile yard sign is built in our workshop. The pumpkin is hand painted orange with yellow eyes. 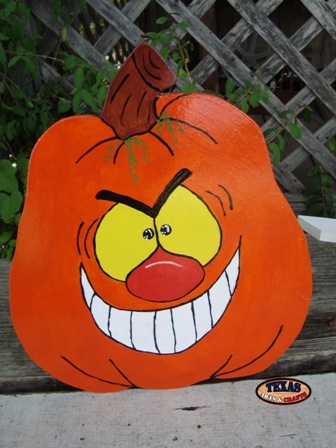 A toothy grin is painted onto the pumpkin. The dimensions for the yard sign are 16 inches tall by 10 inches wide by 1.50 inches deep. The arts and crafts sign has a 18 inch stake. The weight with packaging is 2.50 pounds. For the continental U.S. shipping and handling is included in the listed price. For shipping outside the continental U.S. please contact us through our Contact Us page. The Cheesy Pumpkin yard sign is built in our workshop. The pumpkin is hand painted orange with white eyes and teeth. A cheesy expression is painted onto the pumpkin. The dimensions for the yard sign are 15.50 inches tall by 13 inches wide by 1.50 inches deep. The arts and crafts sign has a 18 inch stake. The weight with packaging is 2.50 pounds. For the continental U.S. shipping and handling is included in the listed price. For shipping outside the continental U.S. please contact us through our Contact Us page. 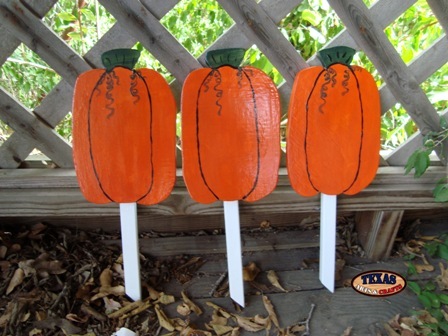 The Plain Tall Skinny Pumpkin yard sign is built in our workshop. The pumpkin is hand painted orange orange. No expression is painted onto the pumpkin. The dimensions for the yard sign are 16 inches tall by 10 inches wide by 1.50 inches deep. The arts and crafts yard sign has a 17.50 inch stake. The weight with packaging is 2.50 pounds. For the continental U.S. shipping and handling is included in the listed price. For shipping outside the continental U.S. please contact us through our Contact Us page. 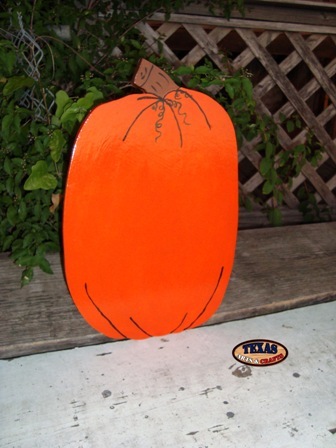 The Plain Squat Pumpkin yard sign is built in our workshop. The pumpkin is hand painted orange. No expressions are painted onto the pumpkin. The dimensions for the yard sign are 12.50 inches tall by 13 inches wide by 1.50 inches deep. The arts and crafts sign has a 16.50 inch stake. The weight with packaging is 2.25 pounds. For the continental U.S. shipping and handling is included in the listed price. For shipping outside the continental U.S. please contact us through our Contact Us page. 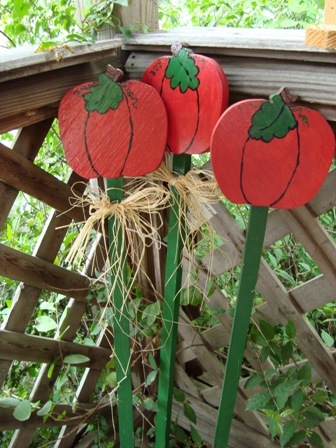 The Three Small Pumpkins yard signs are built in our workshop. The pumpkins are hand painted orange. No expressions are painted onto the pumpkins. The dimensions for the yard signs are 8 inches tall by 6 inches wide by 1.50 inches deep. The arts and crafts signs have a 11.50 inch stakes. The combined dimensions are tall by 6 inches wide by 4.50 inches deep. The weight with packaging is 2.25 pounds. For the continental U.S. shipping and handling is included in the listed price. For shipping outside the continental U.S. please contact us through our Contact Us page. 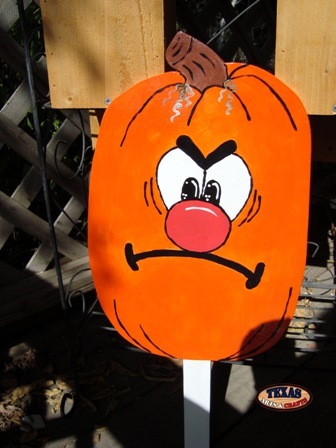 The Angry Pumpkin yard sign is built in our workshop. The pumpkin is hand painted orange. 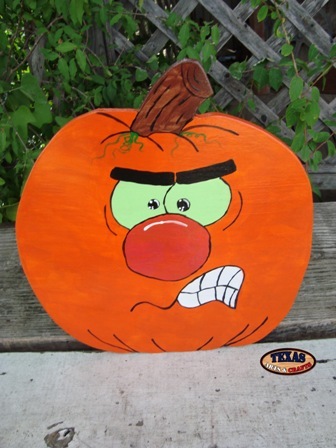 An angry expression is painted onto the pumpkin. The dimensions for the yard sign are 15.75 inches tall by 10.50 inches wide by 1.50 inches deep. The arts and crafts sign has a 16 inch stake. The weight with packaging is 2.25 pounds. For the continental U.S. shipping and handling is included in the listed price. For shipping outside the continental U.S. please contact us through our Contact Us page. 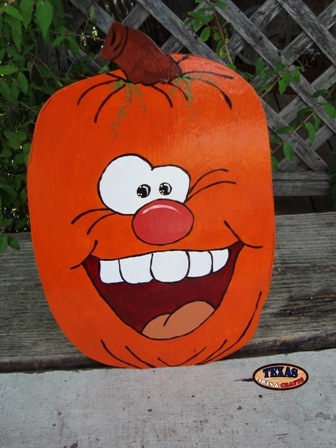 The Big Smile Pumpkin yard sign is built in our workshop. The pumpkin is hand painted orange. A big smile funny face is painted onto the pumpkin. The Three Tiny Pumpkins are built in our workshop. The pumpkins are hand painted orange. The dimensions for the yard signs are 5 inches tall by 5 inches wide by .75 inches deep. The yard art has a 24 inch stake. The weight with packaging is 2 pounds. For the continental U.S. shipping and handling is included in the listed price. For shipping outside the continental U.S. please contact us through our Contact Us page.